A wage impasse between members of Nupsaw and Dis-Chem Pharmacies’ management resulted in the strike, said to be affecting Dis-Chem’s across the country. 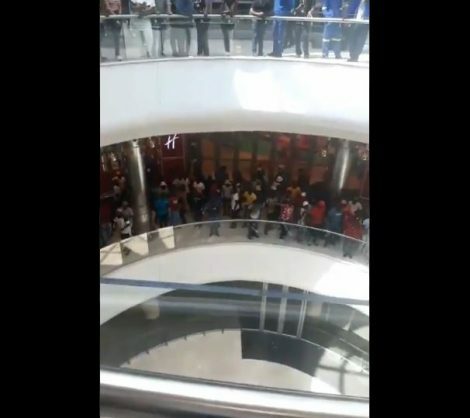 Dis-Chem employees, who were striking near the K101 on Friday morning, made their way to Mall of Africa, reports Midrand Reporter. The employees, under the National Union of Public Service and Allied Workers (Nupsaw), are on a national strike demanding a salary increase to R12,500 and annual bonuses that are equal to basic salaries. About 2,000 employees gathered at Stagger Road earlier today after rubber bullets were fired. Chairperson of the Union Solly Malema said the employer was not prepared to come to the negotiation table with them and that the strike would continue until the company succumbed. “We feel that as we intensify the strike, the company will eventually come to the table and negotiate,” said Malema. Members of the union revealed that three employees were shot and injured after police shot rubber bullets at them. “I had not arrived at the time of the incident but I am liaising with my members. There are reports of two arrested members and we will ensure that they are released soon,” added Malema. Spokesperson for the Midrand Police Station Sergeant Matome Tlamela said police fired rubber bullets after employees closed Old Pretoria Road and threw stones at passing vehicles. “The crowd was becoming violent and police had to fire rubber bullets to try to restore calm,” said Tlamela. 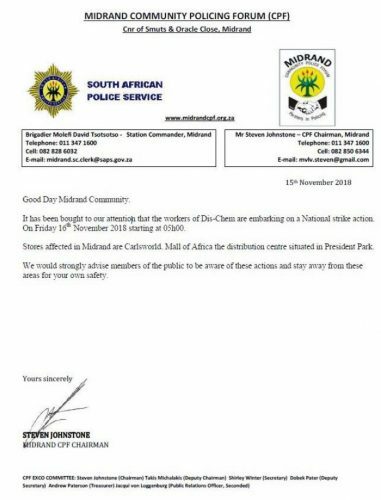 The Midrand Community Policing Forum earlier this morning posted this message on their Facebook page to warn community members about the possible strike action. The notice posted on the Midrand Community Policing Forum Facebook page. On Thursday, IOL reported that the strike was part of a nationwide strike as a result of a wage impasse between members of Nupsaw and Dis-Chem Pharmacies’ management. It was further reported that Malema said the strike would affect Dis-Chem operations around the country. Spokesperson for Dis-Chem Caryn Barker is further reported to have said they could not meet the union’s demands and therefore expected Friday’s strike to go ahead. This is not the first time that Dis-Chem employees affiliated to Nupsaw went on strike. On 17 January, they went on strike outside the company’s distribution centre in Midrand. The strike was said to be aimed at forcing the company to recognise the union.